(CNN) -- Colombian President Alvaro Uribe on Thursday demanded that his ministers of the interior and defense get to the bottom of how a jailed top rebel leader escaped in the northeastern city of Arauca, Colombia. Colombian President Alvaro Uribe wants answers after a top ELN rebel was freed from prison. Gustavo Anibal Giraldo Quinchia, also known by his alias, "Pablito," was freed Wednesday morning when a group of gunmen presumed to be rebels attacked a convoy transporting the prisoner to a court hearing. One guard was killed and another was injured in the incident. Giraldo is a high-ranking leader of the National Liberation Army, or ELN by its Spanish initials, who opposed peace talks with the Colombian government. He was arrested in January 2008. 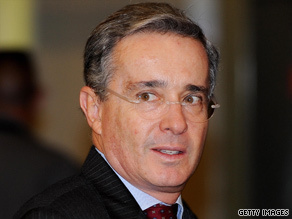 Uribe, who has held a strong stance against leftist rebel groups in his country, had strong words about the incident. "There is no explanation for this escape," Uribe told reporters. "There are signs of corruption around this that are very troubling." The president questioned why Giraldo was transferred from the capital of Bogota to the outpost to Arauca on the border with Venezuela. The security at Arauca was weak, and somehow Giraldo's rescuers knew where and when to find him, Uribe said. "We gain nothing from increased security if there is corruption in that security, like this corruption that permitted the escape of this prisoner in Arauca," Uribe said. The rebel is believed to have fled to Venezuela, and the president has asked the neighboring country for help finding him, Uribe said. The request comes during a period of tension between Colombia and Venezuela, in part because of Colombian claims that Venezuelan President Hugo Chavez has aided the rebel groups. In remarks Thursday, Fabio Valencia Cossio, Colombia's minister of the interior and justice, said that he ordered a new staff to run the Arauca prison. The prison's current director and all 30 guards will be transferred to other posts while an investigation into the escape is underway, he said. Giraldo commanded roughly half the force of the ELN, according to the Colombian government. Formed in the early 1960s, the ELN is the second-largest insurgent force in Colombia, behind the Revolutionary Armed Forces of Colombia, or FARC. The ELN is among several parties to a long-running war that involves leftist rebels, right-wing paramilitary forces, the Colombian government and drug traffickers.